There is a nice news story going around showing Linus Torvalds giving nVidia the finger over their support (or lack of support) for Linux. After watching the video and reading a few of the articles we have to say this about the whole story…. It is spot on, but it was not always that way. I can remember in the early days of the Opteron and Athlon 64 when nVidia (and AMD) had a pretty healthy Linux driver program. Granted it took a while to get nVidia going with Linux support as did support for SLI in Linux and other items, but it looked like once they got started they were going to keep up with it. It is also interesting to note that at the time AMD/ATi was fully supporting Linux and even had drivers that would allow you to leverage the power of your ATi GPU for Folding at Home (FAH or F@H) work units. Looking back you could surmise that nVidia might have decided to support Linux as a way to pushing back at ATi who, at the time, had a more efficient product for FAH. At the time I was writing for a site/forum called PlanetAMD64 and we had a very healthy FAH community that found new and inventive ways to pump out the work units including using VMware Workstation to virtualize Ubuntu systems each with their own GPU driver. It was something to see thread after thread start up about the best ways to do this and how nVidia was not the right card for the job. All of that changed when nVidia released their drivers for Linux. Now there is not the same attraction for Folding at Home as there was then. Yes there is still a large community and some sites like [H]ard|OCP have cranked out 14 million work units, but for the most part it is not the major push like it was. At the same time we are also not seeing the same push to port games to Linux like we used to, again I can remember vividly waiting for that next port of my favorite games (official or unofficial). Does this mean that nVidia has stopped supporting Linux? 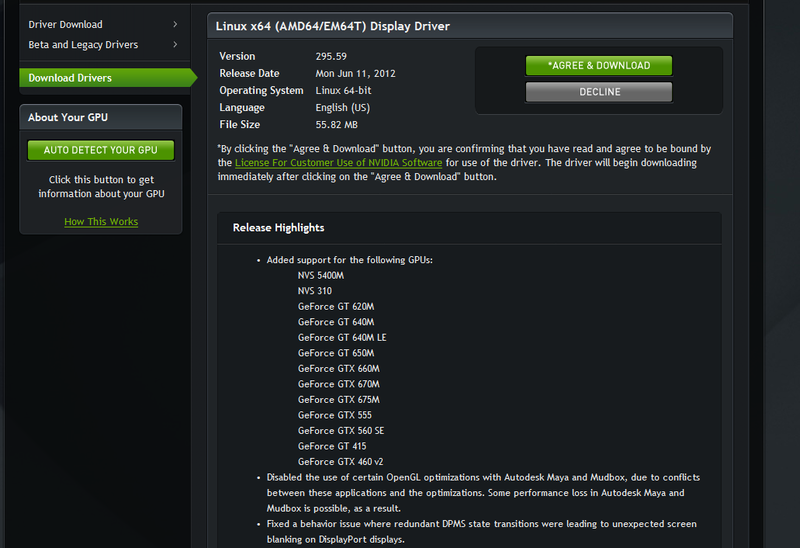 No not really in fact there was a Linux driver just released from nVidia on June 11th and AMD just released one on April 25th. Of course this is does not cover many of the hybrid graphics solutions that are out there like Optimus (that was part of the original question) and specifically mentions the difficulty that people many encouter due to different distributions. So what we have to wonder is; are nVidia and AMD not supporting their GPUs on the Linux platform or are we really talking about a lack of support for other things here? Remember in notebooks the manufacturer is often responsible for driver support as they might have different profiles (thermal, performance) etc involved in their builds. I can remember having to edit .inf files to include my hardware to get 64-bit support on my laptops for quite a while before nVidia announced they would support the graphics hardware with their own driver releases. Now there is another issue that is not touched on here, when someone says Linux what flavor are you talking about? Not all drivers work on every distribution. There are tons of them out there everything from the small and obscure puppy Linux to bigger distributions like Red Hat or Mandriva. While we should expect AMD, nVidia, Intel and others to offer support to Linux, is it right to demand they support every single distribution? I have checked and there is no mention of the distribution that the girl asking the question was using. If she was using an obscure distro of Linux I am not surprised that nVidia did not offer support. If, on the other hand, it was on one of the major distros like Red Hat, Ubuntu etc. then there is a problem. Torvalds goes on to ciritcize nVidia over their support and manages to get in information about Tegra with a comment “nVidia tries to sell chips, a lot of chips into the Android market” What is interesting about this comment is that nvidia’s Tegra Development team has been working on developing their drivers for Android (which is a Linux based operating system). And you can get many of them using the Android SDK that is free from Google (there is an update tool that lets you grab the latest drivers from different sources. So while I can understand some of the frustration that Torvlads put into his commentary I also have to wonder where a company’s responsibility to support something ends. I am pretty sure that the laptop in question probably came with an OS and the user decided to install their own. At that point do you blame nVidia, Intel and all the companies that make up the pieces of the system you bought for your choice of OS? Still whenever someone like Linus Torvalds gives a company the finger in public and follows it with F&(k You it is bound to be news. What I would have liked to have heard is the list of other companies that do not support Linux wrapped up in the comment. nVidia can be a very messed up company and have at many times done som very unprofessional and non-consumer friendly things, but I bet if you were to look hard enough you would find complaints about almost every company when it comes to Linux support.